A little while ago, Nokia Smart Labs tested the performance of operator Voice over LTE (VoLTE) against over-the-top (OTT) Voice over IP (VoIP) services. The results showed that OTT VoIP achieved similar call quality to VoLTE, but required higher bit rates and led to shorter device battery life. OTT VoIP also performed poorly when it came to signaling, data volume and data connections. These tests, however, were conducted under ideal radio conditions with no network load. The Smart Labs team was curious what the results would be with a more realistic scenario. To find out, the team tested both services again – but this time placed the system under various non-Guaranteed Bit Rate (GBR) loads, including best-effort services such as file downloads, e-mail and Internet browsing, and with poor radio conditions. It turns out that VoLTE voice quality is not affected at all by non-GBR traffic thanks to Quality of Service (QoS) configuration, so VoLTE voice quality was kept at a good level. And what about OTT VoIP? Here the story was very different. Under low to medium load conditions, OTT VoIP degraded from 20 to 30%, giving a medium MOS* result which translates into poor to very poor quality. Under high network load, the MOS result was low which means the voice quality was completely unacceptable. Even worse, the OTT VoIP service experienced a 100% call drop rate under very high non-GBR load and 65% under medium load. In contrast, the VoLTE drop call rate was always zero. When it came to battery consumption, OTT VoIP’s current consumption was 30 to 50% higher than VoLTE in the analyzed scenarios. 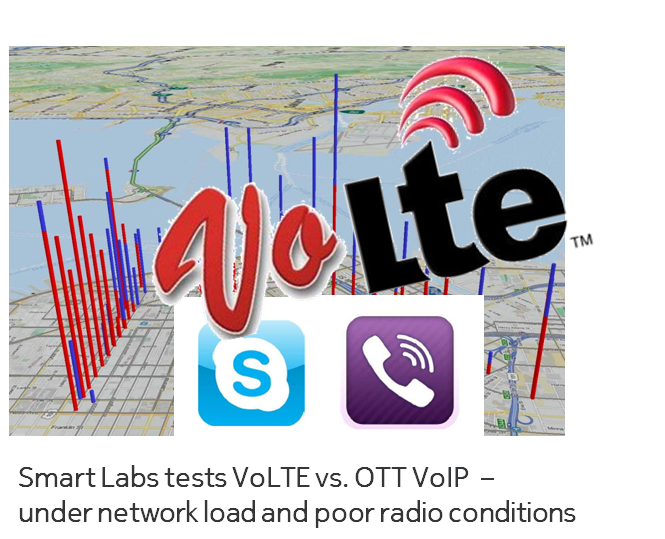 In the real world, these tests show that subscribers can rely on VoLTE for their voice calls far more than they can with OTT VoIP services. We all know how frustrating dropped calls, crackly lines and dead smartphone batteries are – and who wants any of that?! Click here for more information on Nokia’s VoLTE portfolio. To share your thoughts on the topic, join the discussion with @NSNtweets using #NetworksPerform #SmartLabs #VoLTE #LTE #Signaling. * The mean opinion score (MOS) scales from 1 to 5 and indicates the transmission quality of voice and video applications over a network. Here, the Perceptual Objective Listening Quality Assessment (POLQA) Super Wide Band (SWB) standard was used.